Yes, yes, I know, I’m on parental leave. But of course I have to wish all of you a very Merry Christmas, and if that’s not your thing, at the very least, let me say Happy Holidays! Ever since we bought a house and had our first baby, we’ve been the natural hosts for Christmas and the given guests have been our families and closest relatives. This year, however, is going to be a bit different. We now have another child, our baby girl who’s now proudly wearing her new name Filippa, and also because tons and tons of relatives from Fredrika’s side are coming as well. People will arrive at noon for a huge Christmas lunch, with all kinds of specialties that we Swedes eat for Christmas: pickled herring, potatoes, meatballs (yeah, what did you think? :-)), tiny sausages, ham, salmon etc. The plan is to be done with this by 15.00, when Donald Duck begins. What was that, you say? If you’re a Swede, you’d instantly know! For many many years now (46, actually), it has been tradition that the Swedish national television broadcast a certain mixture of comics with Donald Duck, Mickey Mouse, Jiminy Cricket and other Christmas-related figures. I think that ,every year, this is the most watched show on TV, and that about 50% of the Swedish population actually see it. It lasts for about an hour, and after that coffee, cookies and chocolate (traditional chocoalte boxes named Aladdin and Paradis) will be served while we all eagerly await Santa’s arrival! So, that’s how my family celebrates Christmas. If you want to take a minute to tell me how you celebrate Christmas, I would very much like to know and read it! Also, God Jul is how we say Merry Christmas. How do you say it in your country? Have a merry christmas Robert! Merry Christmas Robert or as we would say in Germany: "FrÃƒÂ¶hliche Weihnachten" ; ). From The Netherlands I would say: Prettige kerstdagen en een voorspoedig nieuwjaar! traditionally christmas was spent with my parents and started of with a late night mass in church, then home for sausagerolls, drinks and presents followed the next day by the good old turkey-dinner by candlelight. so "zalig kerfsteest" to you and your family. Great to hear you and your family are doing well. I hope you'll have a great christmas and an awesome 2007. Merry Christmas!! I love the sound of your plans — especially the Disney cartoons! Your girls are just adorable, by the way. The holiday will be crazy for us. I have two toddlers: my daughter is one and my son is two — so everything is pretty much about them. We'll go to my husband's Grandmother's for dinner Christmas Eve. We always take a family picture in front of the small tree she has on a coffee table. Then we'll go to church, then home to get the kids asleep before Santa gets here. Christmas morning will start before sun-up I'm sure. The kids will open what Santa brought, then we'll go over my parent's house for breakfast and more presents for the kids. Then we'll go to my sister-in-law's for a wonderful dinner (Honeybaked ham, baked beans, cheesy potatoes, eclair cake, some veggie that no one will eat) and more presents for the kids. Oh, and did I mention the 24 hours of "A Christmas Story" that will be playing everywhere we go — all day. Love that movie!! 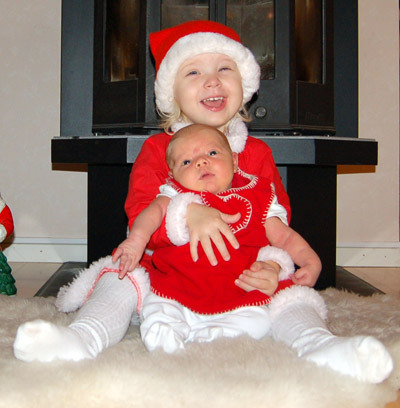 Christmas has always been a whirlwind for us, and is even more so now that we have two children. It is really a lot of fun, though. I envy you and your family that everyone is coming to you. God jul och ett riktigt gott nytt ÃƒÂ¥r! This Christmas day sees me entertaining the immediate family (11) with a cold buffet including the gammon I will honey-glaze and cook the day before. Tommy was telling me how excited and overjoyed he was about the prospect of seeing Donald Duck again, but this time on a 42-inch screen. "Happy Christmas" is the more common term in Britain. Though if the moronic politically correct brigade is around it is called 'Winterval' but I say stuff them. A very merry Christmas and a happy new year to you and your family! Merry Christmas to you my friend! Thanks for sharing that precious picture, and you holiday traditions. It's good to know that food is such an important part of Christmas in Sweden…as it is to me! Do you make requests for your gifts, or are you typically completely surprised when you open it? Thank you very much everyone! Also, an extra thanks for those nice stories how Christmas is celebrated in other families and in totally different places in the world.